This popular excursion is available on all safaris which include an overnight stay at any of the central Serengeti lodges and campsites. It includes a pre-dawn pickup from your accommodation for the trip to the launch site, take–off around dawn, and flight of around one hour duration. After landing, there is a champagne toast, and then passengers are taken to a very special breakfast served out on the open plains under the shade of an umbrella tree. After the meal, everyone is returned to Seronera Wildlife Lodge for pickup by their drivers. The safari is finished by about 9:30 a.m. so that this excursion can fit in with any itinerary — even where not all members of a group want to take the balloon option. Two balloons, with a capacity of 28 passengers in total, fly once each day. 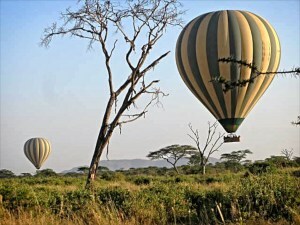 This is the only balloon trip available in Tanzania, and due to its popularity and limited capacity, advance booking is strongly recommended.